On October 16, 1945, Fr. Marcel Lefebvre was appointed director of the scholasticate for philosophical studies in Mortain, in Normandy, where once again he attended to the formation of future priests. But on June 12, 1947, Pope Pius XII appointed him Apostolic Vicar of Dakar. He was consecrated a bishop by Cardinal Lienart, Bishop of Lille, on September 18, 1947, in his native parish of Notre Dame in Tourcoing. Bishop Marcel Lefebvre assumed his duties in Dakar on November 16, 1947. The following year, on September 22, 1948, the pope appointed him Apostolic Delegate for French-speaking Black Africa, which comprised 18 countries. For 15 years he accomplished again on a large scale the missionary work of his years in Gabon, founding new dioceses, seminaries, schools and convents everywhere. Very loyal to Pope XII, he traveled to Rome at least once a year to render an account of his activity and to receive his instructions. The Supreme Pastor chose him to become the first Archbishop of Dakar, where Archbishop Lefebvre was solemnly enthroned by Cardinal Tisserant on September 14, 1955. He received the pallium on June 12, 1958. After the election of John XXIII, Archbishop Lefebvre was relieved of his duties as Apostolic Delegate but remained Archbishop of Dakar. As President of the Episcopal Conference of West Africa, he was called on June 5, 1960, to be part of the Central Preparatory Commission of the Council that the pope had announced to the world the previous year. On November 15, 1960, the pope appointed him Assistant to the Pontifical Throne. The following year he was appointed Bishop of Tulle in France; he took possession of his see on January 23, 1962. 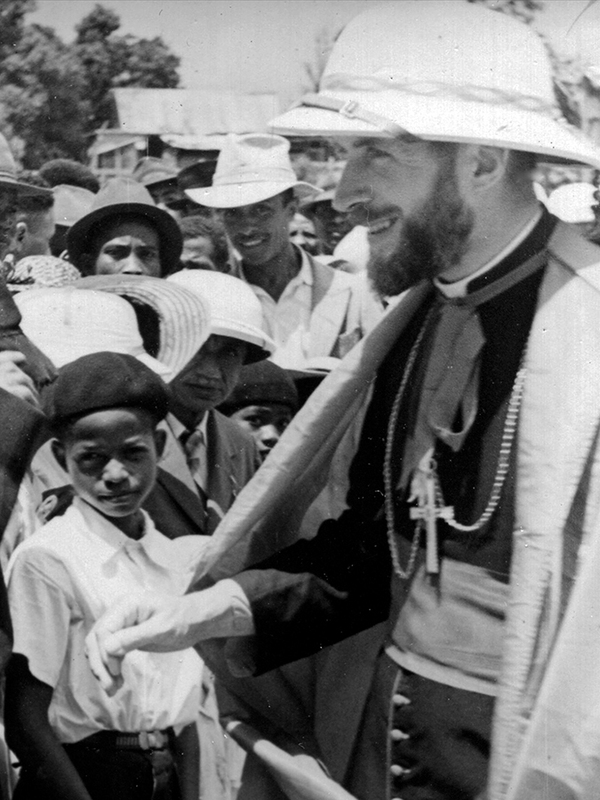 Archbishop Lefebvre left Africa after having organized 21 new dioceses there. The situation in Tulle was gloomy, with vocations and Mass attendance at low ebb. The priests lived in poverty and were becoming discouraged. Deeply impressed by the difference between the flourishing mission that he was leaving and the desolation that he found in France, Archbishop Lefebvre understood that abandoning the cassock went hand in hand with many other forms of negligence inspired by secularizing trends, and especially the mirage of “openness to the world”, which was diametrically opposed to genuine missionary zeal. Archbishop Lefebvre went to work, receiving each of his priests with great kindness, visiting and encouraging them, showing them the importance of celebrating their Mass well, even if few of the faithful attended it. Nevertheless, after only six months, the archbishop was called to Rome, where the Congregation of the Holy Ghost Fathers had just elected him their Superior General on July 26, 1962. The pope bestowed on him the honorific title of Archbishop of Synnada, in Phrygia (today Suhut, in Turkey). Shortly afterward the Second Vatican Council opened on October 11, 1962. Archbishop Lefebvre participated in all the sessions of the Council and was active in the Coetus Internationalis Patrum [International Group of Fathers], over which he presided. During the debates, that alliance valiant opposed the innovators and the liberal majority that made its voices heard in the Council Hall. The post-conciliar period completely justified the apprehensions of the conservatives, especially once the reforms were implemented. Parishes became deserted, religious and priestly life withered, convents and seminaries closed for lack of vocations. The Congregation of the Holy Ghost Fathers, even though it was more than 5,000 members strong and had around 60 bishops, did not escape from the disaster. So as not to have to sign an “aggiornamento” plan that he foresaw would be catastrophic, Archbishop Lefebvre resigned as Superior General during the Extraordinary Chapter that started in Rome on September 8, 1968. He could not condone with his authority the disruptions in religious and liturgical life that were about to be implemented in the name of the “spirit of the Council”.